Reuters | Photo Credit: Sundar Pichai becomes CEO of Google. Google, which has evolved from an internet search engine to a diversified tech giant, is creating a new holding firm named Alphabet to better focus on myriad businesses that straddle driver-less cars, video streaming, balloon-powered internet access, thermostat & smoke detector and more. The corporate overhaul would make the existing Google a privately held wholly-owned subsidiary of the new listed firm Alphabet Inc. Alphabet Inc. will replace Google Inc. as the publicly-traded entity and all shares of Google will automatically convert into the same number of shares of Alphabet, with all of the same rights. Google would retain the internet business while all non-internet business units would move out to become independent subsidiaries of Alphabet. 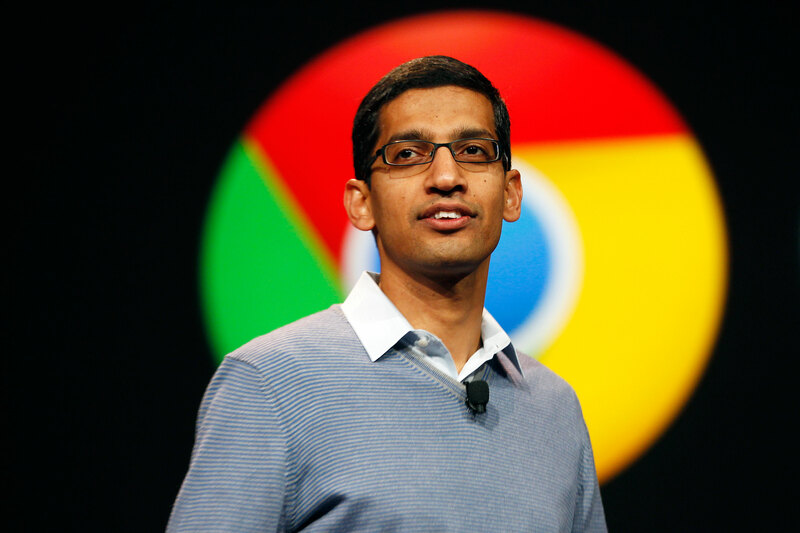 Indian origin top executive Sundar Pichai has been named CEO of the thinned down version Google. Alphabet Inc, a collection of different companies the largest of which will be Google, is to be shepherded by the tech giant's co-founders Larry Page (as CEO) and Sergey Brin (as president), Page said in a blog post. "Aphabet is about businesses prospering through strong leaders and independence. In general, our model is to have a strong CEO who runs each business, with Sergey and me in service to them as needed...this newer Google is a bit slimmed down, with the companies that are pretty far afield of our main internet products contained in Alphabet instead," Page said. The new parent company will house businesses such as Calico (which targets healthcare and illness), X lab (which incubates new endeavours such as Wing, Google's drone delivery effort) and units dealing with life sciences, in addition to the new Google. Google Ventures and Google Capital will also be part of Alphabet. On selecting Pichai as CEO of Google, Page said: "Sundar has been saying the things I would have said (and sometimes better!) for quite some time now, and I’ve been tremendously enjoying our work together....Sergey and I have been excited about his progress and dedication to the company." Pichai was the de facto number two executive at Google ever since he was elevated last October as the company's head of all products with the exception of YouTube. Born to a middle class ‘Brahmin’ family in 1972, the Chennai-bred Pichai found his way to IIT Kharagpur where he finished his undergraduate degree in engineering in 1993. He had a special interest in metals and metallurgical sciences, which led him to finish his advanced degree, in material sciences, at Stanford University. Pichai then pursued his interest in science and worked as an engineer for a couple of years at Applied Materials, a California-based semiconductor company. But the business bug bit him, stirring a desire to understand large corporations. Soon, he enrolled for an MBA programme at the Wharton School of Business in the University of Pennsylvania with a full scholarship. He was picked up by consulting firm McKinsey. But that wasn’t his calling, and in 2004, he joined the then six-year-old Google. Pichai's first project for Google was to create ‘Google toolbar’ and was later entrusted with Google Gears and Pack. Between 2008 and 2013, Page ensured that Pichai’s rise was rapid. He was asked to take over Android's founder Andy Rubin’s portfolio in 2013 to run mobile platforms, and was also entrusted with the task of winning more than a billion users worldwide on to the Android ecosystem. "I feel very fortunate to have someone as talented as he is to run the slightly slimmed down Google and this frees up time for me to continue to scale our aspirations. Google itself is also making all sorts of new products, and I know Sundar will always be focused on innovation—continuing to stretch boundaries. I know he deeply cares that we can continue to make big strides on our core mission to organise the world's information," Page said.